One of the biggest reasons dog owners avoid electric pet fences is because they don’t want to be bothered with digging trenches and burying wire all around their yard. With the Funace Wireless Fence this issue is completely eliminated. This unit is 100% wireless and requires absolutely no burying. There is however one caveat. Your home needs to be big enough to handle the 20 foot leeway from signal difference that can happen due to changes in the weather. The collar is rechargeable and can be ready to go in about 2 hours. Once fully charged the collar will last up to 3 days before needing to be recharged. The more your dog tries to escape the designated area the more you will need to charge the collar. The strap can fit a neck size of up to 24 inches. However, please make sure your dog weighs at least 10 pounds or the intensity of the jolt might be too much. For safety reasons the collar uses anti-over shocking design. Anytime your pet gets too close to the boundary line the collar will send out a strong vibration as a warning. It will then shock for a few seconds, vibrate, and then shock again. After the second shock the collar will shut off. 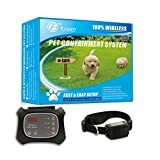 This ensures your pet is not over shocked and traumatized. With proper training it shouldn’t take more than a mild shock to contain your dog. The collar receiver is water resistant and has an IP65 rating. This basically means your dog can roll around in the wet grass or play in the rain without interfering with the collar. 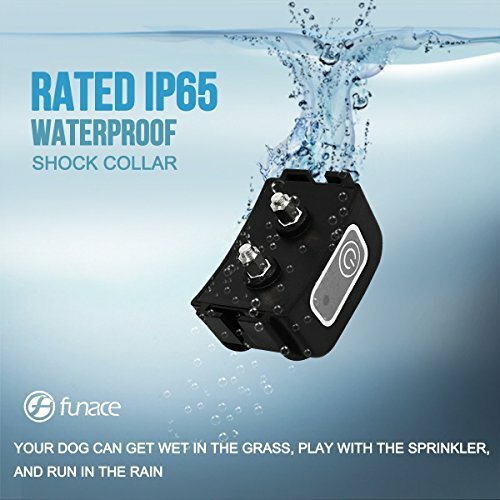 FunAce actually guarantees the collar will continue to work in those conditions. The Funace Wireless Fence offers a large coverage area of up to 17 acres. The coverage area is adjustable and expandable. By adding more transmitters the coverage area can become unlimited. You can also add additional transmitters to help cover the dead spots in your home. This will ensure you have 100% signal coverage. The unit can support an unlimited number of collars which gives you the ability to keep multiple dogs contained at the same time. This wireless fence comes with an unconditional 100% 30 day money back guarantee. That means there is no risk to you to try out the system. If it doesn’t work for your pets simply send it back within 30 days and get your money back. It also comes with a 90 day manufacturer’s warranty. Works on all types of dogs. The collar is cordless and rechargeable which means you never have to purchase batteries. A full charge can last up to 3 days. Can add additional transmitters in the house to ensure 100% signal coverage. Large coverage area. Your dog will have a maximum of 17 acres to run around and have a good time. Coverage area can be expanded to unlimited by adding additional transmitters. The collar receiver is water resistant and has an IP65 rating. System can support an unlimited number of collars. The biggest issues we found with the Funace Wireless Fence is that some users said it randomly shocks their dogs. One user in particular said their dog was well within the boundary and yet the collar kept shocking him. My have a hard time returning the product. While the company claims to have an unconditional 30 day no risk money back guarantee, some users said they had a hard time returning the product. Setting up the levels for the perimeter may be confusing as there aren’t any clear instructions on how to do it. Signal can be affected by weather conditions. If you want to check our list of Best Wireless Dog Fences please click here.